Circumnavigate the West Maui Volcano clockwise starting in Kahului through Lahaina and around the steep scenic cliffs and rugged mauka terrain. It’s Awapuhi Adventure’s West Maui Adventure! Book one now! This adventure begins with a visit to some ancient petroglyphs just south of Lahaina. We will then pass through Lahaina town, which was the centerpiece of the Hawaiian Kingdom and later the whaling capitol of the world. Headed north-west around the mountain is a perfect picture taking opportunity at the overlook for Honolua Bay one of the very few Marine Sanctuary’s on Maui. As we drive along the cliffs there will be opportunities to stop to see the blow-hole and other interesting sights. As we continue around, we enter a beautiful Hawaiian village, one of the last truly subsistence communities on Maui and look into the ancient Hawaiian political structure an ahupuaa, enjoy visiting various local artist galleries the most exhilarating ocean tide pool spots. There are options to stop at a beautiful healing heiau (spiritual site) and breath-taking panoramic views of Haleakala. 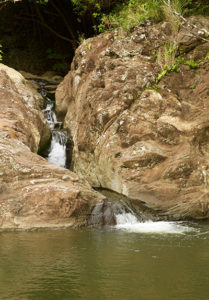 Our West Maui Adventure continues around Maui’s north shore and South side and embarks upon either a heart-pounding 5 mile round trip ridge hike, or opt for a hike through streams, bamboo forests, wild yellow ginger and shampoo ginger groves (season-dependent). We can even have you climb down the roots of a banyan tree and sit above cascading waterfalls after taking a dip under some of the best natural showers in secluded West Maui. Please note safety is our 1st priority and hikes are dependent on weather and rainfall levels. If you still have room for more adventures, your day ends with a leisurely stroll through Iao Valley a lush valley with vertical walls and interesting flora and fauna. Our West Maui Adventure packs in a ton of tropical excitement, tailored to fit your vacation.